Following the great success of “Baahubali” by Rajamouli. Rajamouli is now one of the top directors. Latest leaks reveal that he is gonna direct a bilingual film with Ajith in Tamil and Mahesh Babu in Telugu. We think that this is the reply from Rajamouli for Ajith’s appreciation through phone for his blockbuster “Baahubali”. 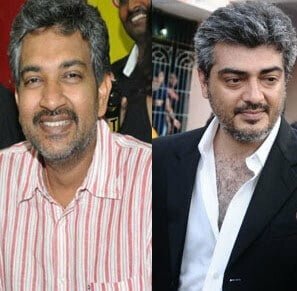 There have been news that Ajith watched Baahubali in Chennai and came home and called Rajamouli and appreciated him for the film. They both have been in a good friendly relationship since the Billa 2 shooting in Hyderabad. Thala Ajith having a majority of Kollywood audience if teamed up with Rajamouli will surely lead to Victory. All Ajith fans are excited regarding this news. It is spreading like wild fire all over social media. We are expecting more leaks regarding this movie which is surely going to be a blockbuster.